Spending patterns on alternative data are beginning to rival outlays for traditional data, according to a recent survey by Dataminr. 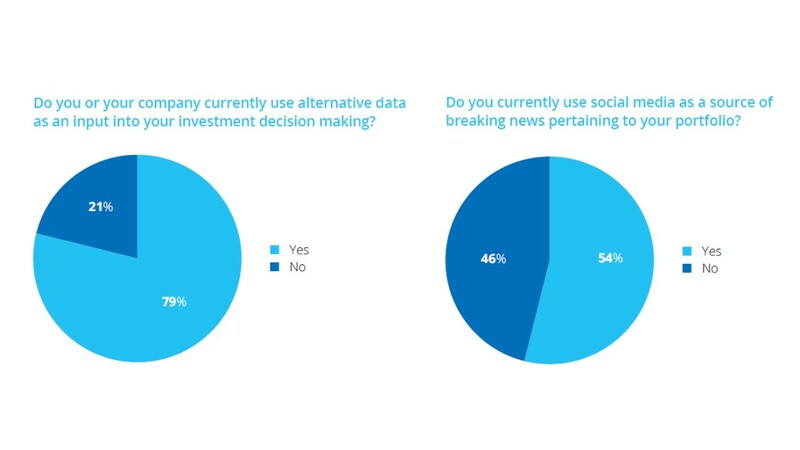 Alternative data usage was prevalent among buy-side participants in the survey but Dataminr may have been disappointed in the responses pertaining to social media usage. Within the trading segment, alternative data usage is beginning to look relatively mature. 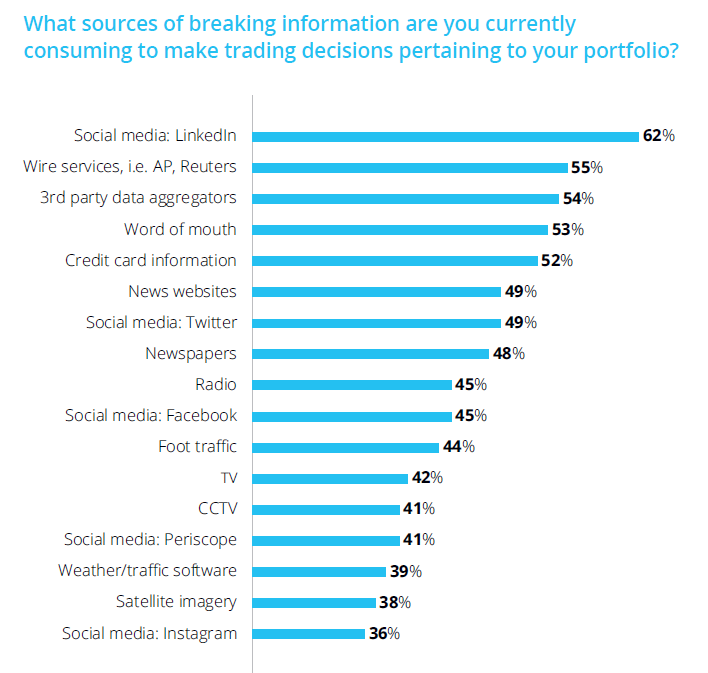 Dataminr, which generates news and signals from Twitter, commissioned a survey of 100 traders (38 respondents), portfolio managers (39), research staff (12) and market data professionals (11) in the third quarter of 2018. Annual spending on alternative data is beginning to mirror that of traditional data sources. 44% of survey respondents spend $1 million or more annually on alternative data, nearly equivalent to the 50% of respondents spending $1 million or more on traditional data. 54% of respondents said that they expect alternative data spending to increase, suggesting that the gap between alternative data spending and that of traditional data will continue to narrow. However, 41% of participants expect to stand pat on alternative data spending. Only 5% expected alternative data outlays to decrease. Disappointingly for Dataminr, Twitter was cited as the sixth most important source for breaking news (although some respondents may have included Dataminr in the 3rd party data aggregators category, which placed third.) Interestingly, credit card transaction data was ranked higher than Twitter as a news source, a result we would not have anticipated. Dataminr mines Twitter for low-latency news and signals which are used by media firms and in finance, with expanding penetration in corporate security applications and the government sector, having won a large contract with the FBI in 2016. It was ranked 69th fastest growing company on Deloitte’s 2017 Technology Fast 500™, based on 2,318% revenue growth over the previous three years. The company was founded in 2009 by former Yale undergraduate roommates. In June 2018, the company raised $221 million in a private placement brokered by Morgan Stanley according to a Form D filing with the US Securities and Exchange Commission. The Dataminr survey indicates that alternative data is more deeply penetrated for trading applications than we would have expected. 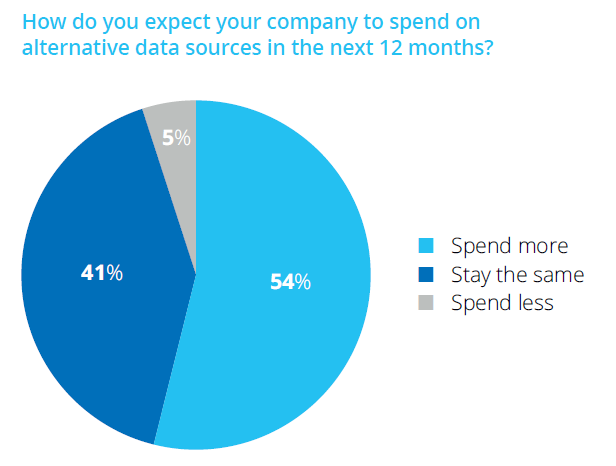 With the alternative data spending patterns beginning to so closely mirror those of traditional data and over 40% of respondents capping their spending, the survey suggests a maturing market for alternative data, at least in the trading segment. This may not be so surprising when you consider that social media trading applications were one of the first use cases for alternative data. It is small wonder then that Dataminr has increasingly diversified its business into new sectors such as government agencies and security applications.